Winter can be a hard time for your pet. The air gets cold and dry, everyone is a little bit less active, and when you do head outside, there are new hazards to navigate - like ice and the salt used to melt it. A few simple changes to your (and their) routine can make a big difference - for everyone! Does My Pet Have Adequate Shelter? Whether you have a cat, a dog, a turtle, or a horse, chances are you need to ask yourself how winter changes your pet's environment. Cats and dogs should be brought inside during the winter, and horses should either be in the barn or have access to a barn or three-sided run so they can escape the elements. Blankets also help keep horses warm and dry, especially when it rains or snows. The air quality in your home is likely to change, so if you have any reptilian pets or other small pets, keep in mind you may need to make sure their enclosure has the right amount of humidity. Indoor pets like cats and dogs should also have a warm, comfortable place to sleep that is off the floor during the winter months. A nice fluffy dog or cat bed makes the perfect winter gift for your pet. How Often Should I Bathe My Pet in Winter? This is a tricky one. You will want to avoid bathing your pet too often during winter, because their skin dries out just like yours! Bathing too often removes essential oils that help hydrate the skin and keep your pet healthy. Dogs especially will need extra attention because ice melts and rock salt are hard on paws and potentially harmful if ingested. Make sure you always have a towel with you to wipe your dog's paws, legs, belly, and muzzle after a walk to remove snow, ice, and salt. How Much Should I Feed My Pet in the Winter? Giving your pet a little bit more food during the winter is actually a pretty good idea! Your pet is burning calories to stay warm, so a little bit more food with breakfast or dinner is usually a good idea in winter - especially for horses who are spending a lot of time outside. You should also make sure your pet has plenty of water to stay hydrated; the importance of water can be easy to forget when it's not hot out, so make sure you're diligent about this. Do My Pet's Coat, Nail, and Teeth Care Routines Need to Change for Winter? As we mentioned above, you should limit how much you bathe your pet in winter to help keep his or her skin hydrated. But there are a few things you can do if your pet gets cracked paws or dry, itchy skin anyway. Petroleum jelly or other paw protectants can be rubbed into cracked or dry paws and noses to help them heal. Make sure you clean and dry your pet's paws, legs, and stomach after every foray outside - this will go a long way to keeping him or her happy and healthy. Nail and teeth care routines will remain the same, but make sure you let your dog's coat grow out a little during the winter months. Fur is nature's way of keeping your doggo warm, so let nature help you with this one. Does My Pet Need Winter Clothes? This question varies depending on breed and personal belief and preference. 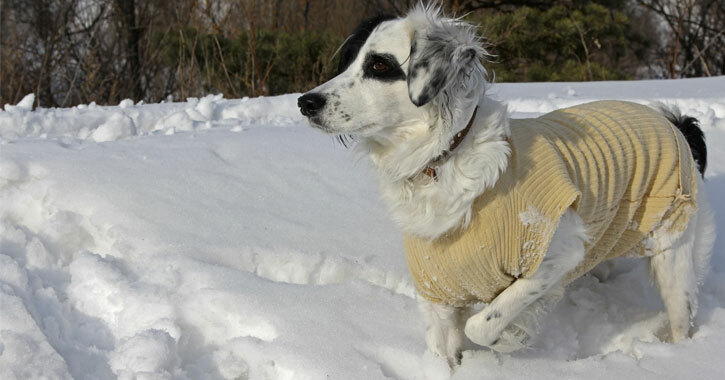 Very small dogs do have a tougher time retaining body heat, and may need a sweater or coat when outside for extended periods of time; this may also be true for short haired breeds. Dogs with long hair are less likely to need protection. However, coats and sweaters should not be worn by dogs inside - only outside, if necessary. Remove the clothing once you return indoors. You might also consider booties for your furry friend, as they protect paws from harmful salt and ice melt. If you have any doubts on clothing your pet during the winter, you can always check with the vet to see if yours is a breed that needs a little extra padding in the colder months.